During the reign of Elizabeth I, the English Parliament introduced a series of measures intended to reform the theology and rituals of the Church of England established during the reign of her father, Henry VIII. But some Protestants believed that these reforms had not gone far enough. These Protestants believed that the Church of England was hopelessly corrupt and incapable of reform. They felt their only option was to leave the church and create new, separate churches. Known as "separatists," these Puritans left their homeland and in 1609 moved to Leiden, Holland, where they hoped to worship freely, without harassment from church authorities. But freedom came at a price. Many Pilgrims settled for menial jobs and a meager standard of living. Their children abandoned their English heritage, favoring the Dutch language and customs. After 12 years of self-imposed exile, it became apparent that life in Holland was not working. 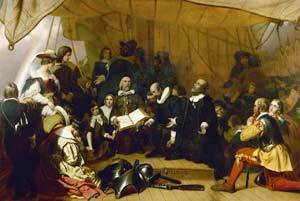 Some members of the Leiden church returned to England, and on Aug. 5, 1620, they sailed for America on the ship the Mayflower. Only 44 of these passengers were Pilgrims, or "Saints," as they called themselves. The rest were "The Strangers," whose primary aim was not to seek religious freedom but to make a profit. A group of English investors, the Merchants Association, sponsored the trip and paid for the supplies; in return, the Pilgrims pledged to work for the association for a period of seven years. Sick, hungry and weary from the long voyage, the Pilgrims landed in the unforgiving edge of southeastern Massachusetts in the present-day town of Plymouth. Their governor, William Bradford, wrote that they had "No friends to welcome (us), no inns to entertain or refresh (our) weather-beaten bodies." Over the winter, half the colony died from cold, disease and starvation. Of 18 married women, only three survived. But the local Wampanoag tribe showed the Pilgrims how to plant corn, beans and squash. The fall of 1621 produced a bountiful harvest. God, they believed, had smiled upon their enterprise. Bradford announced three days of feasting and games to offer thanks. This celebration became known as Thanksgiving, an iconic fest that entered American mythology as a symbol and celebration of divine blessing. Over time, the Pilgrims who clung to Plymouth's rocky shores were absorbed into the Puritans of the Massachusetts Bay Colony. Like the Pilgrims, the Puritans believed that the Church of England needed to be reformed, but they elected to remain within the church, rather than separate from it. They arrived by the thousands, then the tens of thousands, building a thriving religious community that profoundly shaped American ideas of liberty of conscience, the nature of individual spiritual experience and the notion of Americans as a chosen people. The Pilgrims' legacy is less robust, yet they live on in historical memory, immortalized by a national holiday that commemorates their thanksgiving, but forgets the hardships they suffered and their eventual betrayal of their Indian allies.